If you would like a free quote on a phone system, please call us. If you would like us to call you at a certain time, please fill out this form and we will contact you. Thank you! Avaya IP Office 500 version 2 phone system. -comes pre-configured for up to 4 phone lines and up to 6 phones. 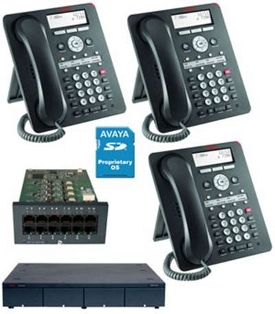 -includes 5 new Avaya 1408 Digital Phones. -works with Avaya digital phones as well as Avaya VoiP phones. This package is a perfect start for any small business desiring a solid, well known phone system with the ability to add voip at any time. Call us today for special pricing!